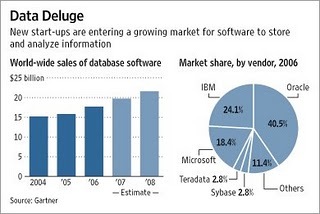 The Wall Street Journal recently ran an article entitled Start-Ups Mine Database Field: Nimble Software Helps Make Sense of Information Tide (subscription required for full text) that validates the imminent mainstream-ing of the top meme I write about on this blog: the rise of special-purpose database management systems. Most databases are based on technology that originated 30 years ago. But change is in the air. A mob of start-ups have been developing variants of the software, which provides the equivalent of filing cabinets for corporate information. Customers say the offerings are generating faster answers to questions that require sifting through huge volumes of business information. Established suppliers aren’t conceding much to the newcomers, but industry executives agree the pace of progress is accelerating. My favorite excerpt includes this quote from chief database guru at Gartner, Donald Feinberg (whose actual title is vice president and distinguished analyst). Some predict specialized products will find a niche. “One kind of database is not going to suit all of the different applications we are coming up with,” said Donald Feinberg, an analyst at market researcher Gartner Inc. I couldn’t say it any better myself. And — whack — think about this. You have the head database analyst at Gartner saying that one kind of database isn’t going to meet all needs. That’s big. And he’s right.